﻿﻿﻿﻿﻿﻿﻿Many years ago the inspiration for a Gospel ensemble was transfixed on our hearts and in the early Spring of 2014, after a long and purposeful search for like-spirited individuals (and much prayer), Grace Notes was born! It is our hope that our name (which did not come easily!) reflects our shared faith and love of a gracious God and our unending gratitude for the opportunity to use our music to reach into the world and share ‘The Gospel Message’ through inspirational and uplifting song. Having maternal grandparents who were both Welsh and avid singers, music has always been a huge part of Kim’s life. She joined her church junior choir at the age of 7 and sang her first solo at 8. In Grade 3 Kim was invited to participate in a mass choir concert with other students of the Lincoln County Board of Education and there she met Henry Goerzen for the first time. In junior high her love of vocal music soared under the influence of a dedicated teacher, Victor Sylvio, whose engaging style had almost every Intermediate student joining the choir. While in Grade 8, he encouraged her to choose a high school which offered vocal music and also to join Canadiana Youth Choir under the direction of Henry Goerzen. Kim studied both vocal and instrumental (viola) music at Sir Winston High School and was again inspired by the love and power of music through two wonderful teachers; Gunther Lofflemann and John Toth who afforded the choir and orchestra opportunities to travel and perform in prestigious venues such as the Canadian Parliament Buildings and the White House. The Canadiana choir sang throughout the region and Southern Ontario, as well as touring Germany, Austria, Yugoslavia and Italy. They even sang for Pope John Paul II’s mass at the Vatican and Kim was privileged to shake the Pope’s hand and speak to this tremendous promoter of peace. Kim completed her Conservatory of Music Grade 8 in Vocal Studies. She attended the University of Western Ontario and began an Honours BA in Music Education. She completed one year of the program, however, not having a background in theory and piano proved an insurmountable obstacle to moving forward in the program and she returned to the Niagara region and attended Brock University where she earned a degree in Sociology. Kim returned briefly to Canadiana, then under the direction of Rick Wyatt, following which she joined the Chapel Singers directed by her dear friend Henry. Following her marriage, a move away and back again, Henry invited Kim to join his ‘new’ group, Curtains Up! Productions (as they would become known). From there he lead her to become involved with an amazing group of ladies who would become fast friends - ‘Heaven Scent Trio’, a mixed quartet – ‘The Troubled Clef’, a small ensemble – ‘8 Is Enough’ and the Sunday worship and praise team at Ina Grafton – ‘The Praise Singers’ and once again Chapel Singers then under the direction of Joyce Rempel. 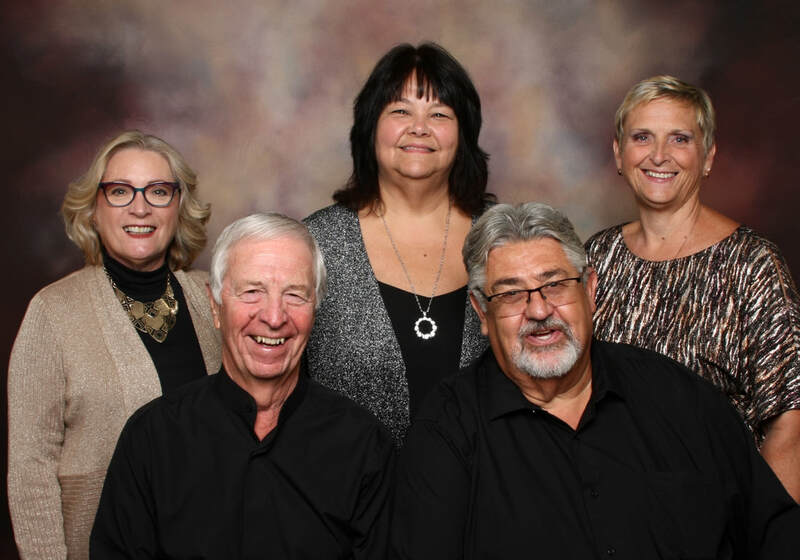 Kim is thrilled to be part of the ‘Grace Notes’ family...a “great group of friends who have been drawn even closer through our love of song and by the opportunity to spread the message of God’s peace, comfort and love”. Currently employed by the Region of Niagara - Seniors Community Programs, Kim is the Co-ordinator of their Respite Companion Program. She is the proud mother of two lovely daughters Taryn and Shaelyn. ﻿﻿Laurie grew up surrounded by a musical family. She was a member of St. Andrew's United Church Choir before joining the Praise Singers Sunday ministry under the direction of Henry Goerz﻿en and th﻿e Chapel Singers community choir, then under the direction of Joyce Rempel. Being mentored by Henry, she has, since his passing, taken over as musical director of the Praise Singers. Laurie is 'the cream in the middle' of Heaven Scent, a Ladies Gospel Trio and the Director of 'One Voice' a non-denominational community choir. She feels it is the best of all worlds to be able to direct and sing with her friends. The evolution of Grace Notes has long been tugging at Laurie's heartstrings as she, Henry and Randy had many discussions over the years about the possibility of just such a ministry. With all the right players finally in place, Laurie delights in every aspect of Grace Notes from rehearsals to concerts. With each new song, her faith is strengthened and remains awed by the possibilities of reaching out with God's promising message. In her day to day life, Laurie is a Central Educational Assistant with Special Needs children. She has been employed in this challenging, yet rewarding, career with the District School Board of Niagara for 32 years. Paul began his ‘musical’ career as a trumpet player in community, high school and university concert bands and at church. He participated in many music festivals and competitions both individually and as part of these groups. During his high school years, he was cajoled into joining the choir by a great music teacher who made being part of the choir ‘prestigious’ and ‘cool’! Paul most enjoyed Sunday night church services because of the first fifteen minutes...the ‘song service’ ...during which the old familiar hymns, still close to his heart, were sung in full voice with both piano and organ accompaniment. Paul shared a few solos in church over the years, however, in 1977 the associate minister and organist urged him to make his ministry more personal by developing accompaniments and arrangements and singing them in his own style. Two of Paul’s favourites were ‘My Tribute’ by Andre Crouch and ‘The King Is Coming’ by The Gaithers. In 1978 these same supporters encouraged Paul to join the Chapel Singers; a community-based, interdenominational choir which sings sacred and gospel music. This offered Paul the opportunity to continue to grow and learn musically and to minister with an outstanding group of Christian musicians. Paul was thrilled to be invited to become part of Grace Notes and has fully embraced the vision for our musical ministry! He believes God was preparing him his whole life for this moment in time. Paul enjoyed a rewarding career as a teacher, principal and Superintendent of Education and in retirement serves as an Education Consultant for Family and Children’s Services, Niagara. A member of Queen St. Baptist Church in St. Catharines for over 30 years, Paul has served on a number of committees. Aside from his love of singing, he enjoys golf, travel and taking piano lessons. Paul especially takes pride in the family bonds he has built with wife Cathy, his two sons and six amazing grandchildren. Music has played a huge part in Randy’s life for as long as he can remember. In elementary and high school he sang in the school choir and was a regular in the cast of his high school musicals, often providing the ‘comic relief’, a role he has maintained with flair in our Grace Notes family! Randy sang with the Canadiana choir under the direction of his music teacher, Henry Goerzen. When he was just fourteen, Randy lost his father. During the subsequent years Henry’s positive influence, both musically and as a caring teacher and friend, had a huge and lasting impact on Randy. They remained the best of friends for over 40 years until Henry’s passing in 2012. Until this time, their musical paths continued to cross as, in 1976, Randy joined the Chapel Singers under Henry’s direction and then some 20+ yrs. ago became a cornerstone member of Curtains Up! Productions. A driving force behind the advent of Grace Notes has been Randy’s passion for Gospel music (love those Gaithers!) and his promise to his dear friend that one day their shared vision would be realized. For Randy, there is a tangible excitement in the air when Grace Notes rehearse and the anticipation of sharing ‘a melodic message of faith’ with an audience and impacting lives through music is truly a blessing! ‘Mr. Furnace’ (as he is known by his friends) has become a household name in Niagara and surrounding areas, as over the past 40 yrs. Randy has built a successful career as the General Manager for the heating and air conditioning company of the same name. Family times at home or the cottage, a great Sabres game and traveling are favourite pastimes for Randy and his wife Susan. Along with their four adult children, two ‘kids in law’ and three granddaughters, they anxiously await the birth of their fourth grandchild! Joyce was born in Rosetown Saskatchewan as a PK (preacher’s kid), to her father, Rev. W. Dickau and mother Mary Dickau. Later, three other siblings were born to the family -- Wayne, Wendel, and Jackie. From an early age Joyce developed a deep love for God, family, church and music. She accepted Jesus as her personal Saviour, was baptized, and dedicated her life to being of service to God. She remembers the first time she called out a favourite hymn during the Sunday evening hymn-sing, at about the age of six. It was ‘In My Heart There Rings a Melody’ ..... “I have a song that Jesus gave me, it was sent from Heav’n above. In my heart there rings a melody, there rings a melody of love." ..... Those lyrics have remained a resounding theme throughout her life. Joyce began formal piano lessons at the age of seven and quickly put her talents to good use playing for the Wednesday night prayer service at the age of nine and then for the Sunday worship services by age twelve. At the same time Joyce became the accompanist for a community children’s choir. By the age of fourteen she had become the director of her church’s youth choir. Joyce later received her Honors BA as a music major from Brock University, and then went on to Teacher’s College. As a young adult, Joyce met Mr. Henry Goerzen, who greatly inspired her, and encouraged her involvement as the accompanist for Chapel Singers from 1977 to 1982. He later provided the opportunity for her to become the director of Chapel Singers where she served from 2000 to 2009. In twenty-nine years of teaching for DSBN, Joyce had a great love for her students, and regularly sought to have them involved with singing for various community events and fundraisers. She was especially thrilled to have them perform together with Chapel Singers in the annual ‘Reaching Out With Love” concert series. Joyce has been blessed to be the pianist/organist/choir director/music director of several churches. Most recently she served at Kingsway Baptist Church in Etobicoke, where she was delighted to work alongside her brother, Pastor Wayne Dickau. Currently, Joyce is retired and thoroughly enjoying her participation with Grace Notes. She first met Laurie, Kim and Randy during her years with Chapel Singers, where they also all served on the board of directors. And Paul---well, she has fond memories of him from her days at Lakeport Secondary School, where he was her enthusiastic and thought-provoking history teacher! Joyce presently lives in St. Catharines with her supportive husband, John. They are very proud of their two wonderful adult children, Deanna who lives in Cancun, Mexico, and Joshua who lives in Welland, ON.